The A-frame is made from anodised aluminium and will not rust through continuous outdoor use. It has a white back board and chromed anti-slip feet. Safety features include chromed rounded corners and two locking arms to help create stability. A1 and A2 round corner a-boards provide a modern and efficient way of displaying poster advertisements. A-boards can help gain additional passing trade for your business. This quality pavement sign uses snap frame technology to hold two posters back to back. A snap frame is made from four anodised aluminium profiles that open by hand and snap shut under spring tension. 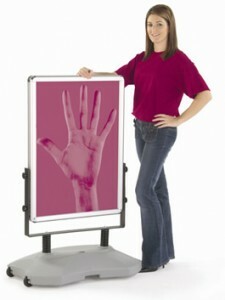 Clear anti-glare covers help protect your posters from rain and dirt. Our A-boards are individually boxed and no assembly is required. A1 designed to hold A1 posters of width: 594mm, height 841mm. Visual area: 578mm x 824mm (Please design your A1 posters so that text and images are within these dimensions). 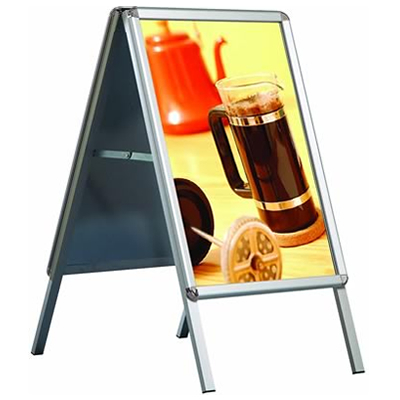 Overall A-board width: 655mm, height: 1200mm. 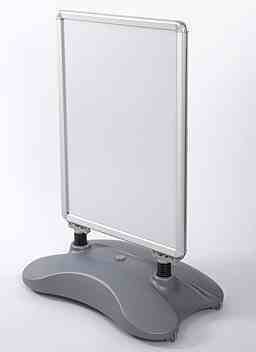 A2 designed to hold A2 posters of width: 420mm, height 594mm. This spinning motion cuts through existing advertising clutter and gets your product noticed while the soft round corners and high gloss injection-moulded components promote your brand due to it’s upmarket and attractive appearance. This spinning sign is designed to start spinning as the wind blows and through it’s movement is able to attract attention even in high traffic areas like pavements, walkways and forecourts. This sign is the perfect choice for any business, event or company wanting to promote itself. £240.00 + Vat includes full printing.